I don’t think many people will be able to say that they have had the chance to see #HISPZ12 from every single angle: As a blogger, as a Social Media professional, as an agency correspondent, and as a volunteer. Although exhausting, it was a truly rewarding and well-rounded experience. If we add to the equation the fact that I wasn’t the only one from the agency around, tenemos cartón lleno. 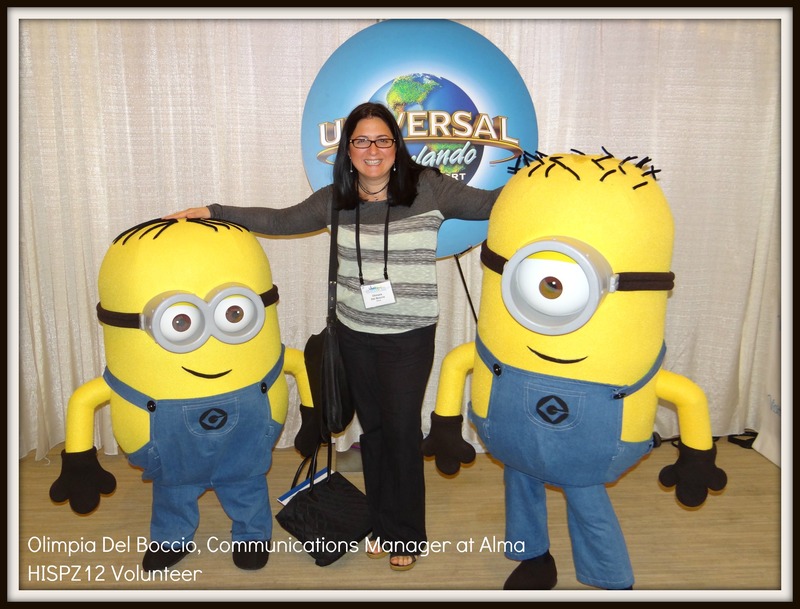 So, where could Alma be found at #HISPZ12? At times, “divide and conquer” was our motto. When an event offers 5 simultaneous sessions, even if you want to absorb ALL this knowledge, you simply can’t clone yourself! Nevertheless, when the final stats show that your hashtag was among the “Most Popular” ones, you know your performance as a digital communicator was accomplished. On the clients’ side, many of ours were sponsors and/or presenters. Clorox offered visitors a nice relaxing space in the exhibitors’ hall, and its announcement of “Red de Enfermeras Hispanas” was a true accomplishment. McDonald’s presented a session related to its excellent education endeavors and, best of all, took all VIP bloggers to a Yacht Party on Wednesday night. What’s not to love! Cricket encouraged attendees to “build the perfect music playlist for the VIP screening of ‘Scarface,’ which was so much fun. State Farm left its footprint during the conference by offering a “case study” session, as well as the participation of yours truly in a panel to talk about how we engage with fans in the State Farm Latino Facebook page. Agencies have become more selective at the time of accepting projects, no matter how big or small they are. From Twitterland to Facebook, and everything in between, my alter ego is known as @LatinaComm. The feeling of meeting in person those people with whom you have been networking for months, in some cases even years, is simply priceless. The [virtual] urban legend of bloggers being their own impenetrable little club is completely false. The welcoming could have not been warmer. It was encouraging and even energizing knowing that people truly appreciate your message and they simply wanted to stop by and say hello; people wanted to put a tangible face to those Twitter handles and Facebook profiles. This fact supports the overly used argument that social media will never replace that face-to-face relation. No need to add here that ROR (Return On Relationship) is obviously the new ROI! Overall, both the quality of the sessions and the organization were impressive, so kudos to the Hispanicize/Manny Ruiz team. Any learnings you want to share with us? Feel free to leave us some comments! It was VERY cool finally meeting all of you in person. I enjoy my Twitter & Facebook communities a lot and now I can put [pretty] voices to all those avatars. Great post. Now following your blog.